The USB2-8COMi-TB is a USB2 to 8-port industrial serial adapter that protects your device(s) with 15KV ESD protection and 600W surge protection over each port. It is designed to make RS-422 and RS-485 serial port expansion quick and simple through its terminal block connections. Port signals are controlled by DIP switches as is the control over termination and biasing. Each serial port terminal block can be individually designated for the signal your application demands. The USB 2 to 8-port serial adapter has an industrial designed metal case where the DIP switches are located within the bottom metal access panel. 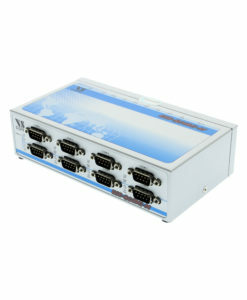 By connecting to the USB port on your computer or available USB hub, the USB2 to 8-port industrial serial adapter instantly adds eight RS-232/422/485 serial communication ports to your system while taking advantage of both the Plug-and-Play, and Hot-Plug features of the USB bus. The USB2-8COMi-TB industrial serial adapter makes it very easy to add 8 industrial communication ports to your system though its terminal block interface with DIP switch controls. The 8-Port RS232-422-485 Serial TB Adapter has certain accessories that work with it. These accessories are what you can order if needed. Did you misplace or break a part that came with your 8-Port RS232-422-485 Serial TB Adapter? Purchase it here!